The ‘Healthy Eating Is Everyone’s Right’ discussion panel was held this Saturday morning (5) at the 3rd National Agrarian Reform Fair in São Paulo, Brazil, and brought together scientific knowledge, religious faith, and political mobilization in defense of the agroecological movement. Jaime also took the opportunity at the debate to recommend something to everyone who attended it: “What I recommend is: let’s cook! The further away we get from the kitchen, the closer we get to processed food, which is a diet based on monoculture, massive use of agrochemicals, income inequality, and concentration of land ownership,” she said. The nutritionist also pointed out that taking on the responsibility for making your own food is not just an important initiative to take care of your health, but also a political statement. “Our everyday choices, when we choose between packaged food or cooking fresh food, are a determining factor for the Brazilian food system,” she said. “It’s not that there isn’t enough food in this world. It’s this evil thing called inequality. Healthy eating is a right for everyone,” the bishop said. 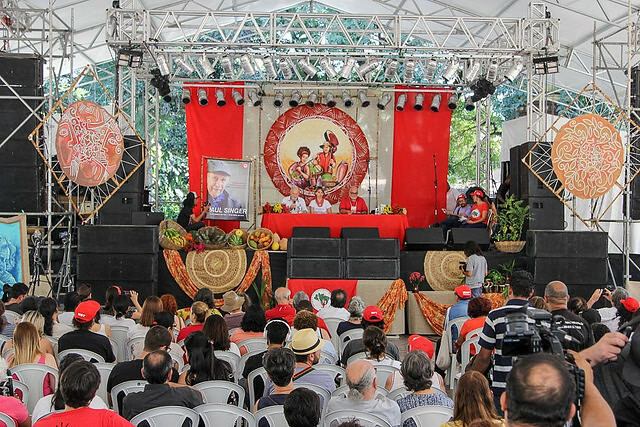 One of the leaders of the Landless Workers’ Movement (Movimento dos Trabalhadores Rurais Sem Terra – MST), João Pedro Stedile, once again pointed out the movement’s commitment to keep pushing the debate on healthy eating as a right.